As I was walking back to the cars, the Sierras were being beautifully lit up, with several egg-shaped buttermilk boulders in the foreground. Carinna, who is also plagued with the Christmas birthday curse, decided we should get away. I tossed around the idea of returning to Bishop, which always has a special place in my heart . After talking to some friends and coworkers about Bishop, I think Carinna was totally psyched. "December 11-15. Put it in your calendar," she said to me. Somehow, in the hustle and bustle of the holiday season, I found several people who were down to make the journey down there. The last day of 27 absolutely sucked. It consisted of waking up at 4:30am to get on the road, a 16 hour car ride through a blizzard warning, and finally arriving to the 30mph winds blowing across Bishop. After wrestling with the wind to set up tents, I finally settled into my sleeping bag. The wind then rocked my tent and blew sand and dirt into my tent for hours. Finally, at 4 or 5 in the morning on my birthday, the wind died down and it started to rain. The tumultuous cap to 27 exemplified the year as a whole, and gave way to the calm, peaceful start of 28. Ally getting ready for the crux move on Solarium, V4 in the Happy Boulders. The morning was overcast, and the skies seemed ready to pour. But I had faith the weather would turn out for the best. After all, it was my birthday! After heading to town for coffee and a proper breakfast, the sun started to come out. We headed out to the Happy's for a half day of climbing. Despite some light sprinkles, we got a solid day of climbing in. I did a repeat (retro-flash!) of the Hulk (V6). The Hulk was a problem I worked on so many times, and finally got in March. Felt good to get it again in one go. I was also able to get another V10 - Redrum Sit. 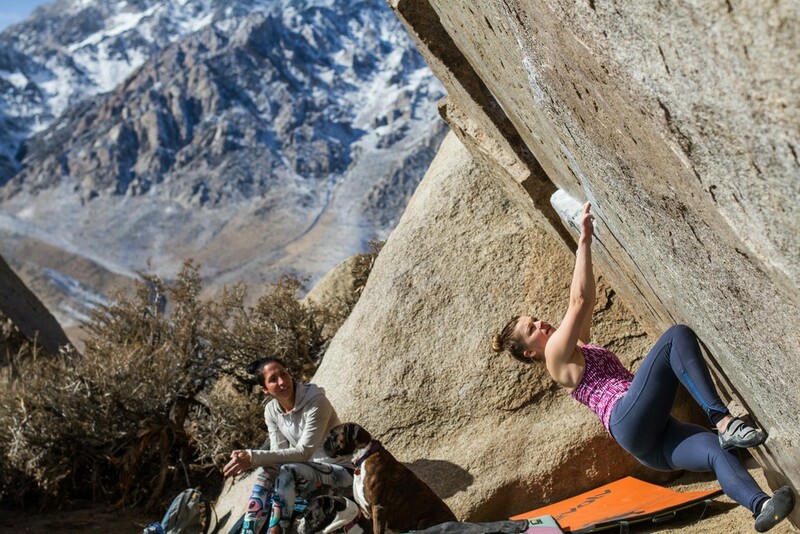 The 3 moves for the sit start are surprisingly easy; the regular Redrum (V7) was very challenging. After figuring out the beta, the problem went after two goes. I was happy to get such a hard problem in one session. Usually it takes me multiple visits. After a surprisingly solid day of climbing, we made a quick dinner at camp and then headed out to the hot springs. It was a great start to my 28th trip around the sun. Emma climbing up the featured patina face of a warm-up V0. Carinna and Tia hanging out atop a giant boulder, chatting it up with the mountains. 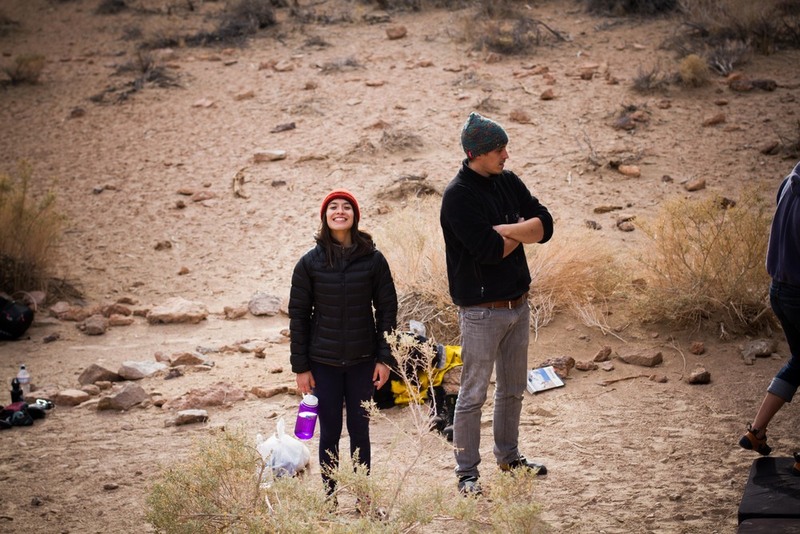 Chaney and Carinna spectating folks working on Solarium. Our last day, we did a quick, end-of-day session at the Sads. This is the trail going into the backside. 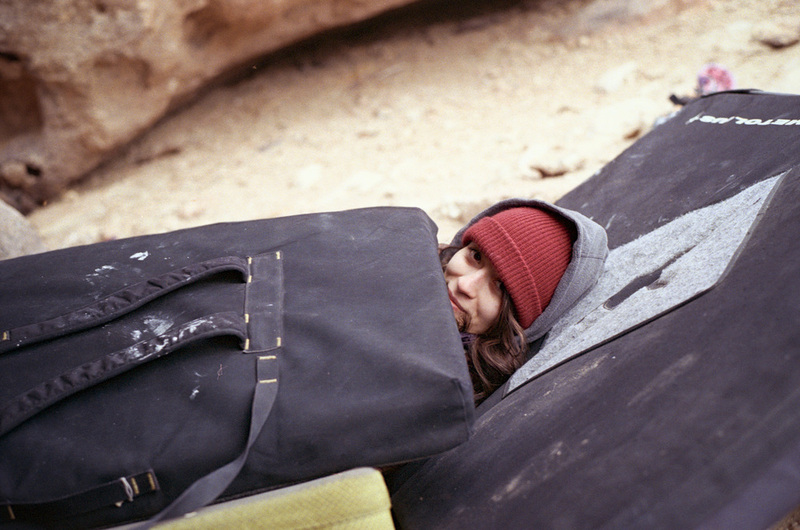 Carinna seeking warm shelter between two pads, beneath the Redrum cave in the Happy's. Carinna, all smiles as she waits for her turn on the Hulk. 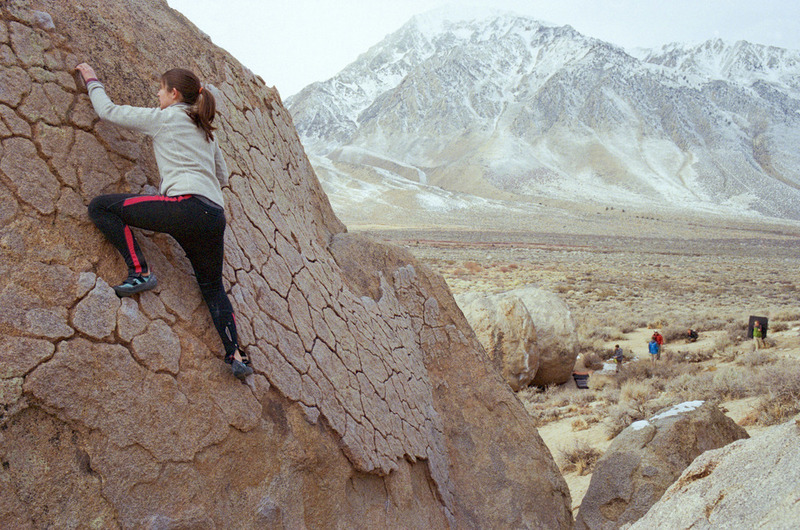 The next day, we trekked out to the Buttermilks and spent the day there trying some of the classics. I made some good in roads on another V10, Bubba Gump. I figured out the moves and was able to get it in two parts. However, I wasn't able to piece it together. I went back the next day with every intention to 'send, but on the third day climbing, the fatigue and thin skin prevented me from victory. To cap off the day, we went out to the Sad's and worked several problems in the Ice Caves. John-Paul being hulky on the Hulk, V6. This trip was pretty short, but I feel very lucky to have gone there for my birthday to spend it in a beautiful area and with a really great group of people. I have a good feeling this year is going to be amazing, and I couldn't have picked a better way to kick it off. So thank you every who made this trip spectacular! 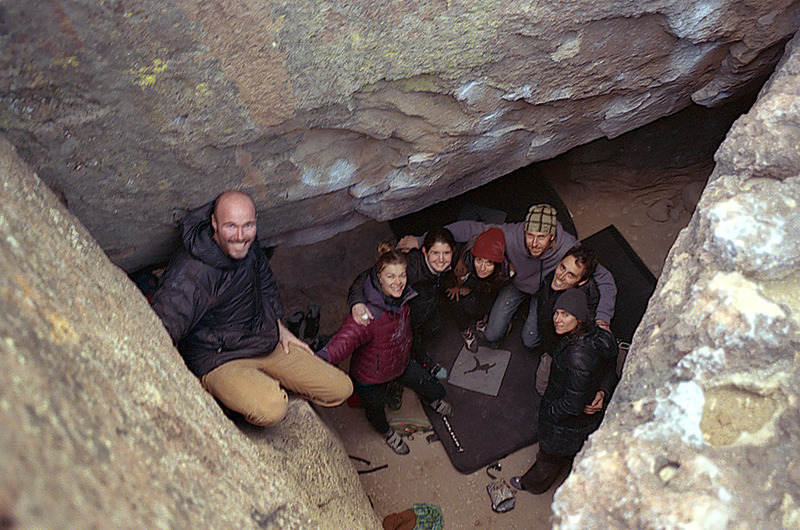 The crew posing for a photo while working Mothership Connection in the Ice Caves. Most photos were taken on my Leica M6 on Kodak Ultramax 400 film. A few I took on my digital, Canon 7d.